270 pages | 69 B/W Illus. Although DFS is a widespread, worldwide technique, no books focused on this subject have been available until now. 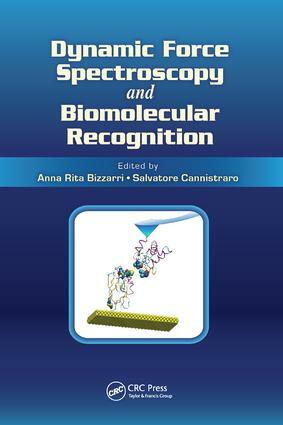 Dynamic Force Spectroscopy and Biomolecular Recognition provides the state of the art of experimental data analysis and theoretical procedures, making it a useful tool for researchers applying DFS to study biorecognition processes. Anna Rita Bizzarri received her degree in Physics in 1987 from the University of Rome. She obtained the Ph.D. in Biophysics in 1992 from SISSA in Trieste. After postdoctoral fellowships in Perugia and Mainz she joined the Science Faculty at Tuscia University, Italy, as research assistant. In 2000, she became Associate Professor of Physics and in 2006 she got the position of full Professor. Her scientific interests include spectroscopic investigations and MD simulations of electron transfer metalloproteins. More recently, she has focused on single-molecule level detection by surface enhanced Raman spectroscopy and scanning probe microscopies for both fundamental and applicative aims. Salvatore Cannistraro obtained his degree in Physics in 1972 from Pisa University. He received his Ph.D. in Biophysics at Liegi University,Belgium. In 1977, he became reader of Biophysics at Calabria University. He moved to Perugia University in 1981 as Associate Professor of Molecular Physics. Since 1991, he has been a full professor of Physics, Biophysics, and Nanoscience at Tuscia University, leading the Biophysics and Nanoscience Centre. His scientific interests include optical, magnetic, neutron spectroscopies and modelling of amorphous and biological systems. More recently, he is focusing his activity on the application of AFM, STM, and Raman SERS to single biomolecule detection and nanobiomedicine.